Numerous bowls to hold blanched tomatoes. 12-16 quart canning jars with lids. Makes 12- 16 quarts of sauce. 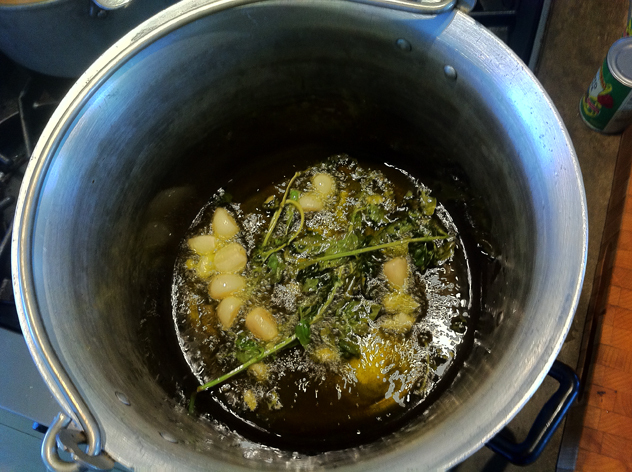 In a large pot heat olive oil ( I like to use quite a bit) , throw in 10 cloves of peeled garlic cloves and bunch of basil. Remove basil when leaves are crispy. Continue to brown garlic. Remove garlic. Turn off heat. The cooked garlic and basil flavor the oil. In a 2nd large pot- heat half a pot of water. 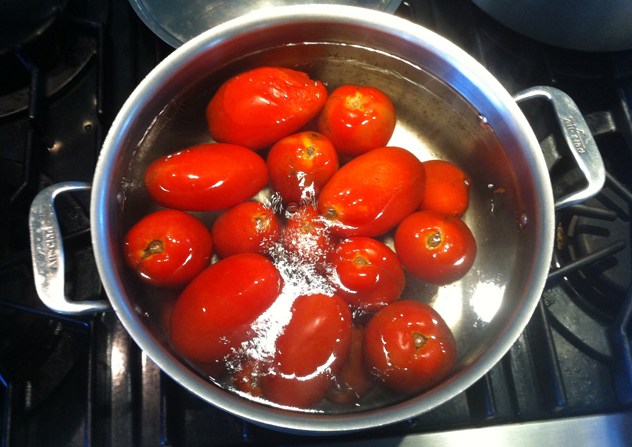 When water comes to boil- drop plum tomatoes (working in batches) into water for 1-2 minutes. 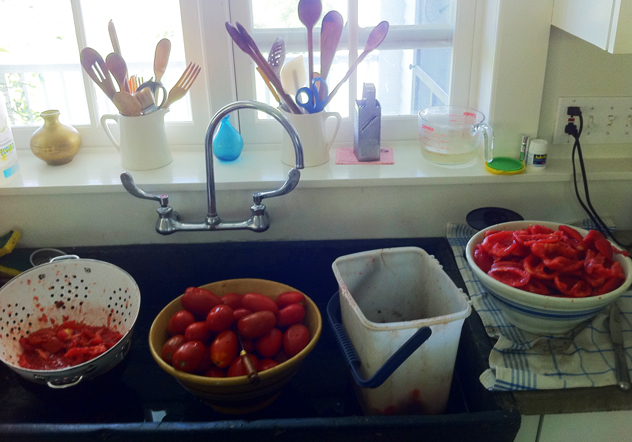 Remove tomatoes and place in several large bowls- continue until you finish all tomatoes. 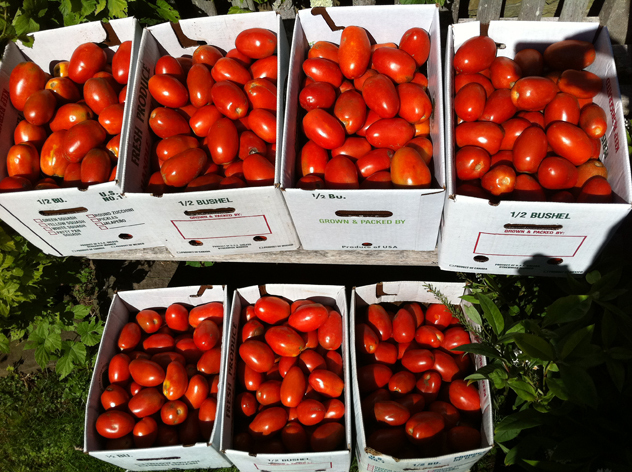 The blanching process makes it easy to remove tomato skins. Once you have finished blanching all plum tomatoes. You will need a colander or sieve, a bucket for skins and work in kitchen sink or large counter area. Using a paring knife remove the top stem and core of the tomato. Slice tomato in half and peel off skins. Place skins in a separate container- can be put in compost pile if you have one. Place tomato halves in a colander over a bowl- collecting any juice. Work in batches until colander is full of clean halved tomatoes. 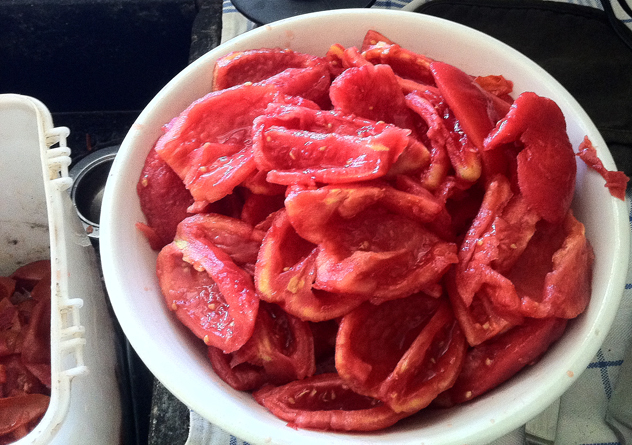 Next step is remove seeds and any hard parts of tomato flesh – place seed- clean tomato flesh in a bowl. Be sure to collect all juice and seeds. You want to keep this liquid and use a sieve to separate seeds. Discard the seeds and pour juice into large Canning pot with tomatoes. 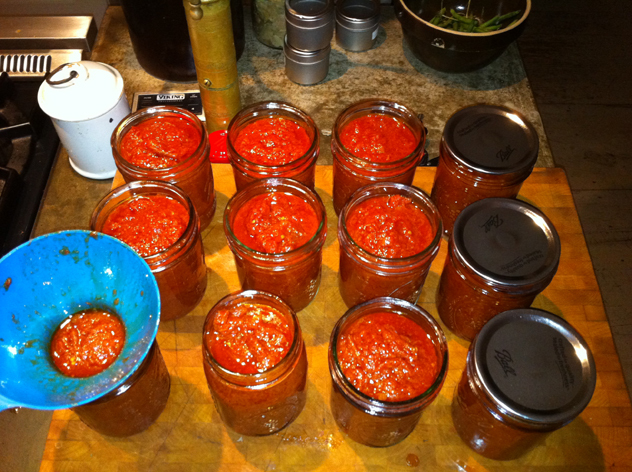 Turn heat up high once you have filled half the canning pot of tomatoes. You can keep cleaning and adding tomatoes and juice as you start to cook the sauce. Whole process takes me about 3 hours. 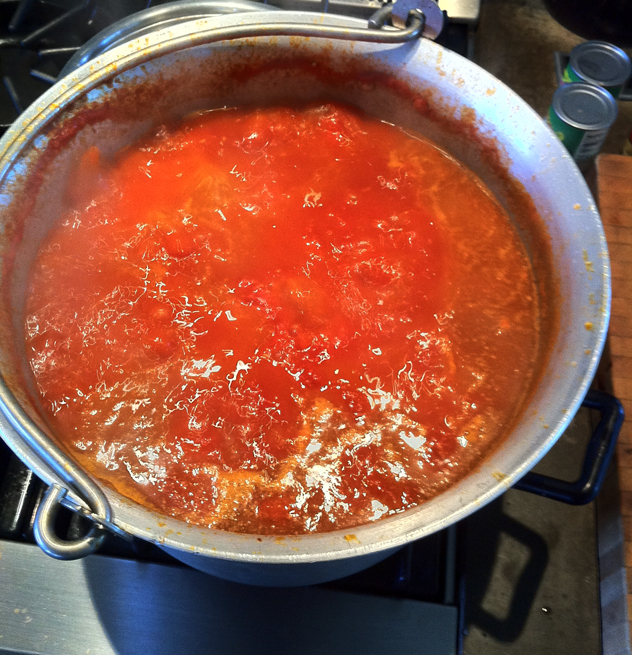 Bring heat to high and reduce sauce by about ½. Keep stirring pot while you reduce sauce to prevent bottom of pot from burning. Takes at least an hour to reduce this much sauce maybe longer. Canning. Once the sauce is reduced by half or the constancy you like you can then can the sauce. I use a canning funnel to pour sauce into clean quart jars. Place lids and lightly screw lids down. Don’t tighten them too much because jars can break when you’re boiling the jars. Place jars in large canning pot cover with water. Place canning pot on high and once the water starts boiling time the bath for about 25- 30 minutes. When the time is up you can remove jars using a canning jar lifter. You will hear the lids make a ping sound and that means the seal is good. Once the jars have cooled you can tighten lids and always write the date on the top of the can with a magic marker. I have found the canning jar lifter and funnel in garage sales. These implements make the process much easier. They can also be bought new and are inexpensive.